Bay College was awarded the OER Degree grant from Achieving the Dream (ATD) in June of 2016 but prior to receiving it, they had already implemented a process to transition courses to OER and to create OER courses. These early projects helped the college to prepare for applying for the grant since it provided valuable experience working with OER. Bay College has saved students over $250,000 on textbooks so far. An OER Degree pathway in Liberal Arts will be offered for the first time in Fall 2017. It consists of 74 credits using OER courses adopted at Bay College and which have been approved by Lumen Learning, the technical assistance partner for the grant. The impact on the overall student body is expected to be significant as pathway courses include those that a large number of students need to take for an Associate of Arts degree, for example ENGL 101 and others. The primary motivation for developing OER degrees is helping students to succeed in college. If faculty redesign their course materials with instructional designers, select OER and customize it for the students they know best, and then give FREE access on day one, students will pass more classes and save money. We have saved students over $250,000 on textbooks so far. The challenges to developing and OER Degree have ranged from a lack of commitment among faculty to adopting OER and publishers responding to their shrinking market share with short term price decreases. We encountered resistance from some faculty who had no desire to change from what they are currently using. In one case those two classes were all we needed for a degree pathway in that department. 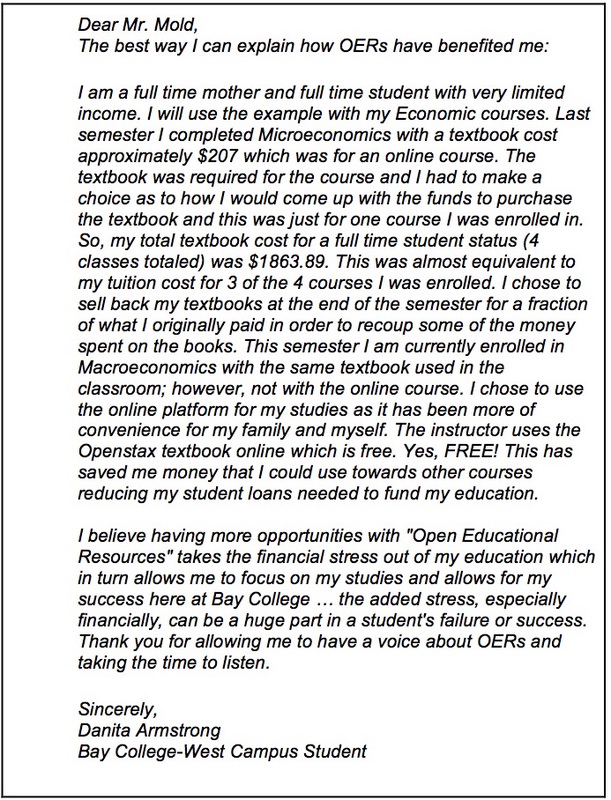 Some faculty who initially agreed to adopt or adapt OER resources for their courses later reneged on their commitments due to the amount of work involved and promises from publishers that their current textbook costs would be greatly reduced. Faculty who reneged will be encouraged to consider going OER again in the future. The excellent support available to them from the college OER team will be emphasized and also that publisher textbook costs reduced by 50% are still too high for many students. It is also likely that publishers will increase again after one-time reductions. Finding lecture slides, homework solutions with dynamic graphic user interfaces and other materials that is in the creative commons and CC-BY and open are hard to find. That is slowly improving. The amount of time it takes to find an open resource, edit and remix it then compile that into a document or .pdf is time consuming and requires a team of people like instructional designers, web designers and subject matters experts. The more you work with OER you begin to develop a order of operations and it gets smoother each time. As more people continue get on board the “open train”, more will follow. One unexpected challenge has been the price decreases in digital publisher packs that have been a response to the growth of OER usage. Pearson for example has significantly reduced the prices of their products. This just happened to coincide with our college moving a lot of classes over to OER. Unfortunately, the timing of those reduced prices has affected the commitment of some faculty to adopting or adapting OER. Currently the college is experiencing a lot of difficulty working with the publishers of the reduced e-books. They are now telling us that the e-books won’t be available until 4 days before the semester starts and some a week after the semester starts. This is unacceptable! Another reason why I like OER! Bay College has used a number of strategies to engage key stakeholders in this work. Building a successful OER degree involves faculty engagement, student awareness, administrator buy-in but has also involved a strong partnership with the college bookstore. All administrators are worried about student completion, withdrawal, and persistence rates. Giving students free access to course materials on the first day seems like a great way to get students engaged faster. This is at the core of Gagnés 9 steps of instruction: gain attention, right away, on the first day. And all the data so far for using OER is in a positive direction. The college has engaged students through a number of fun activities such as an OER rally where they learned about OER and were treated to pizza! Another activity was a scavenger hunt where students used the Goosechase app to log their activity in completing challenges like sharing their work using Creative Commons licenses, posting to Wikipedia, sharing photos on Flickr, and more. The participants had a great time and learned a lot about OER. One of our winners was even asked to present what she learned about OER and Creative Commons to an English class on campus. Instructors currently using OER have explained to their students the benefits of OER and have encouraged them to ask other instructors who are not using OER to consider it. Overall, feedback from students has been very positive. The bookstore manager has been great to work with around OER. When they receive the PDF files to be printed, they send the files to the printer and the textbooks are on the shelf in time for the students that want to purchase a hard copy…for under $40. Faculty are starting to see the power of creating their own OER materials and remixing current OER materials into their own notes. Content creation and remixing from OER gives the faculty the power to create something for their students in the way they want it presented and how they want it presented. It also speaks to the core of an educator, sharing your knowledge with others. Data collection is still underway with the full OER degree available for the first time this semester (fall 2017). Bay College has participated in the first round of Achieving the Dream’s OER Degree research studies whose findings were released in June. The college plans to share more outcomes after a larger data set is collected over a period of years. Be ready to invest the time required to make it successful! From recruiting instructors, to locating OER, to fitting the pieces together, it takes a lot of time from a lot of people. Before deciding on a degree, it might be beneficial to see if there are key instructors in required courses that are willing to take part. Without the required classes, it’s impossible to make the OER degree come together. Be realistic with instructors when telling them about the amount of time and effort that will be required of them, maybe even overestimate. Ask for solid commitments from individual faculty; consider developing a mutual agreement document that clearly spells out what faculty are committing to. Bay College has provided quality higher education for 50+ years. The main campus is situated on 150 acres and serves over 5,000 credit students each year, including those completing baccalaureate and master’s degree programs sponsored by partnering universities. Home of the first Michigan Technical Education Center (M-TEC), the Center provides a variety of customized and technical skill training and professional development opportunities for working age adults across the Upper Michigan Peninsula.